Inhalant Allergens cause allergic reactions because when the allergen is inhaled and lands on the sensitised lining of the nose, the conjunctiva of the eye, or the bronchial tubes it will cause an allergic reaction. The main causes of seasonal asthma, hay fever, and conjunctivitis are tree pollens in the spring, grass pollen in June and July, and mould spores from July to October. The moment a pollen grain or mould spore lands on the moist lining of the nose, the eye, or the bronchi the allergen begins to leak out of it, and if the person is allergic to pollen or spores a reaction occurs at once by sneezing in an attempt to get rid of it. Release of the allergen from the pollen grain or mould spore happens very quickly, and repeated inhalation of thousands of pollen grains or mould spores day after day causes incessant sneezing, itchy eyes, and sometimes asthma. and made a video through the microscope of this remarkable phenomenon. Checking the pollen count every hour shows how it varies dramatically at all times of the day, depending on the weather conditions. This is because more pollen is shed from the grass in dry windy weather, but the pollen count varies from hour to hour, being usually worst in a sunny breezy evening. In the damp British Climate the pollen season is succeeded by the mould spore and yeast season which lasts until late October. Hay fever, and especially asthma, also occur at this time, and are even more closely linked to the weather. 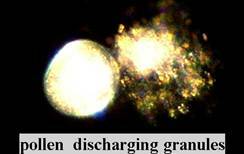 Rain in a thunderstorm may wash the pollen out of the air, at the same time liberating huge numbers of tiny granules, which are so small they may be the cause of epidemics of “thunderstorm” asthma, and are very allergenic. Millions of mould spores get airborne during the day, especially in the afternoon, and because spores are much smaller than pollen grains they get inhaled into the depths of the lung. In the early hours of the morning billions of yeasts appear in the air, especially in the low-lying river valleys in the Midlands, just when the asthmatic s are having attacks of asthma. When there is a spell of wet and damp weather enormous numbers of yeasts in the air will persist through the day. Many patients who are sensitive to mould spores do not get better until the first frost, because the cold prevents the mould spores being shed into the air. These patients are better to keep the windows shut at night. In the unusually dry summer of 1976 many patients found that their hay fever and asthma had been much better, because the main cause of their problems was moulds and yeasts rather than grass pollen. 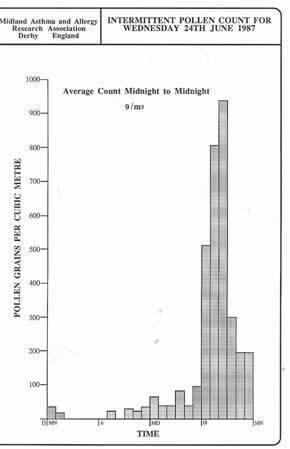 In damp years patients who had been effectively desensitised to grass pollen complained that after this treatment they were worse in wet weather instead of dry! The truth was that before injections for their pollen sensitivity they were miserable in both wet and dry weather. The treatment had abolished the allergy to pollen, but they were still sensitive to the moulds and yeasts. Most sufferers try to avoid the pollen by staying inside as much as possible, keeping the car windows shut, having a car with a pollen filter, not playing tennis in the evening, and taking antihistamines or nasal steroid sprays. A minority of hay fever victims cannot obtain relief from drugs, have troublesome side-effects, or oral steroids are contra-indicated for some reason. Desensitisation using Grazax tablets taken under the tongue rather than injections is now available on the NHS, but very seldom paid for. The effectiveness of this treatment for hay fever due to grass pollen has been confirmed by extensive trials at the Brompton Hospital. Many people feel generally ill with hay fever, and their performance at examinations and their general efficiency is impaired by the allergic reaction and often by the drugs as well. Many simply put up with it and get antihistamine tablets, steroid nasal sprays, or herbal remedies from the chemist, and assume that their GP will be unable to help them. This is not correct, as a great deal can be done. Steroid sprays, such as Beconase or similar, are most effective, but only if the treatment is commenced about week before the sufferer knows from previous experience that the hay fever is due.. The spray is then used regularly, every day whether there are symptoms or not, supplemented with antihistamine tablets if necessary, until the season is over. This regime makes sense because if the hay fever is allowed to develop the nose gets blocked, so nasal sprays become useless because the spray cannot get inside the nose. The antihistamine taken may be one from the pharmacy which is less effective than those available on prescription, but might cause excessive sedation and even falling asleep at the wheel on a motorway. Depot Steroid injections. have been given for many years for hay fever, and are very effective, but there are serious objections to this treatment. Quite a large dose of steroid is contained in the depot, and the drug is released into the circulation at a steadily decreasing rate over about six weeks. The amount released bears no relation whatever to the pollen count which varies dramatically from day to day and hour to hour. If the depot injection is given too soon it may all have been released before the end of the season, symptoms recur, and another injection may be required. Most importantly, this treatment is have been found very occasionally to cause necrosis of the head of the femur, requiring hip replacement. Although this is a rare complication, it is clearly not reasonable to run even this risk for controlling hay fever. Also the injection sometimes causes a small dimple due to absorption of fat. In really severe cases of hay fever a few oral steroid tablets, instead of a depot injection, can be prescribed to be taken for a few days when the hay fever is at its worst, or if there is an important occasion such as an important examination, a wedding, or a job interview. This treatment is 100% effective, and because it is taken for a short time only there is no significant risk of any side-effect because the total dose is much less than that given in a depot injection. The patient is prescribed a small supply of steroid tablets, with instructions to take three when the symptoms have become intolerable, or just before the special event. This dose will usually completely abolish the hay fever in a few hours and relieve all the other symptoms as well. Three tablets a day is usually enough, but the daily dose can be varied as necessary from none at all up to three tablets a day, rarely four. I usually give 20 tablets, which is usually enough for the whole season as oral steroids are seldom required for longer than a week. Inhaled steroids are relatively ineffective in severe hay fever because of blockage and congestion.. In a minority of people the bronchi also become sensitised to pollen, which liberates tiny granules from the pollen grain which reach into the smallest bronchi causing asthma. Pollen asthma can be very severe and require treatment with inhaled steroids, plus short-term oral steroids when necessary.. Pollen counts are unpredictable, depend on our fickle British weather, and fluctuate wildly from hour to hour. I have observed that the average hourly pollen count can be 150 for the day, but the peak can be over 1000. Any asthmatic who is aware that they have severe asthma every year should consult their doctor at the very beginning of the season before the asthma becomes a problem. This is to commence effective treatment to prevent the development of severe and possibly dangerous attacks which can happen with little warning. It is not unusual for severe asthma in the night to be due to a delayed reaction to the pollen inhaled during the day, which can be very severe. For example some years ago a young man who was very pollen sensitive drove 120 miles from London to Derby in a car without a pollen filter, checked into his hotel, did not come down for dinner, and was found dead in the morning In the spring tree pollens, especially birch, get in the air in large numbers, especially near or under the trees where the pollen counts can be very high indeed. These pollens cause the same problems as grass pollens, but the season is not so long. Many patients have grass pollen hay fever as well, so they have a much longer season. The season for mould spores extends well into the autumn and causes not only hay fever, but also seasonal asthma. The season is much longer than for pollen only, often not ceasing until the first frost. A hard frost seems to be an unusual event in recent years, perhaps due to global warning. Research by the Midlands Asthma and Allergy Research Association in Derby over many years has established the importance of mould spores in the causation of asthma in the valley of the river Trent. In this low-lying area with much agriculture and many canals and rivers the spore counts can, depending on the weather conditions, be very high indeed. 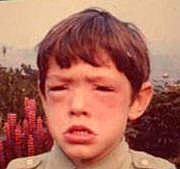 Treatment is usually by inhaled steroids and bronchodilators, as mentioned in the asthma section. 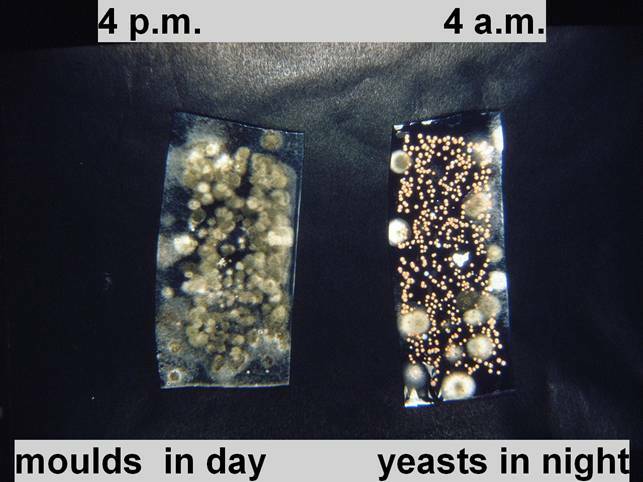 Sometimes the effects of individual mould spores have been demonstrated by means of daily spore counts per cubic metre of air compared with the daily Peak Flow rate recorded by the patient. 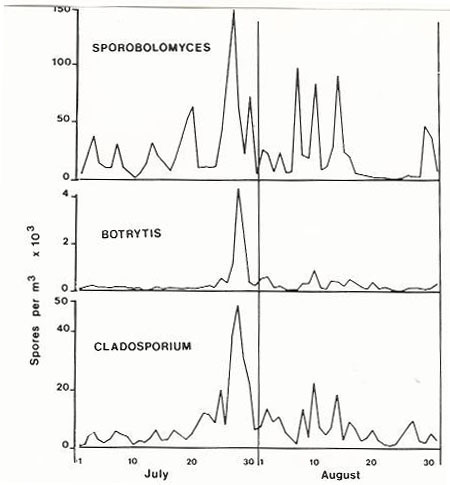 The examples below demonstrated that the spore counts could indicate exactly which mould or yeast spore is responsible for the asthma or hay fever. 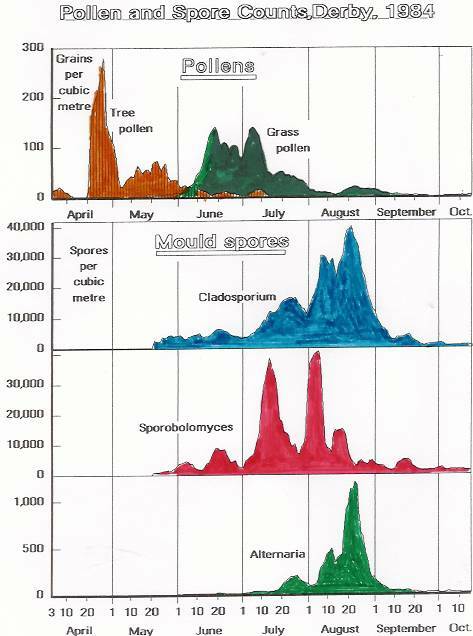 Unfortunately the spore counts for several major mould spores often increase at the same time, as shown in the graph above. The reason is probably that the same weather conditions trigger the release of many types of spore into the atmosphere, with the result that the individual counts cannot indicate clearly which spore is the cause of the asthma or hay fever. This difficulty was important when it was possible to actually cure these patients by desensitising them against the specific mould spores to which they were reacting. The relationship between the spore counts and symptoms was extensively studied by the Midlands Asthma and Allergy Research Association for many years, but only some of the results were published. It may be of interest to readers to show here some of the more remarkable charts relating to individual patients, even though this information is no longer of any practical use because specific and potentially curative treatment can no longer be carried out in the UK. Asthma due to Botrytis, proved by challenge Test. This case of seasonal asthma shown on right was proved to be due to three moulds by bronchial provocation tests, skin tests being negative. 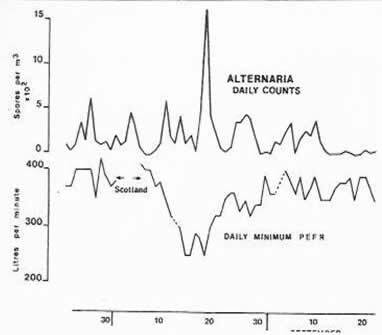 She was allergic not only to the moulds botrytris and phoma, but also to the yeast Sporobolomyces which gets into the air in huge numbers in damp weather in July and August in the Midlands of England, especially in the early morning hours. This asthmatic was allergic to grass pollen and also sporobolomyces, to which the skin test was negative but the nasal test positive. There is no obvious correlation with the pollen count because she had been thoroughly desensitised to pollen before the season. weather instead of dry, as had been the case in previous years. 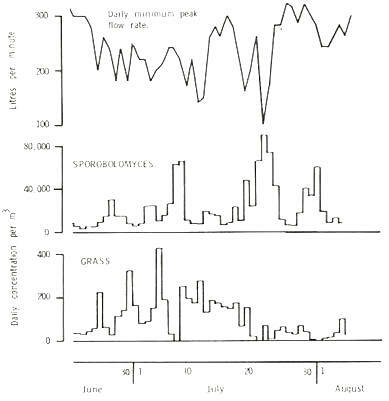 It is unfortunate that there is no peak flow graph for the previous year, which would have shown that both pollen and sporobolomyces counts related to the peak flow. Weed pollens, such as ragweed cause major problems( Ambrosia Artemesiiifolia) in the USA, and related Mugwort (Artemesia vulgaris) which is growing along all major roads in this country is also a very powerful allergen. So far the Mugwort does not seem to be causing much trouble in August, but may be a problem in the future as a result of global warming. Parietaria is a major problem in southern Europe, and beginning to cause trouble in the south of England. Allergy to weed pollens does not seem to be a common problem, and will usually respond to appropriate steroid aerosols and antihistamines. 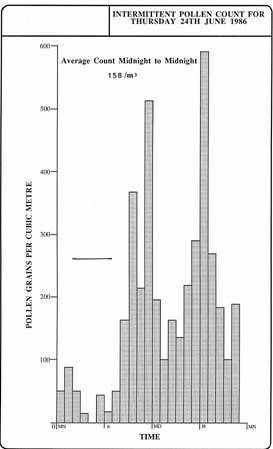 This chart shows how the tree pollens start in the spring and are succeeded by the grass Pollen. This chart explains how the history of exactly when the patient has allergic problems is very important. Cladosporium is the commonest summer mould and takes over from the grass pollen, but is much less allergenic and does not cause problems very often. It is prevalent in daylight hours as a rule. Sporobolomyces is released into the air in the small hours of the morning, but will persist through the day in very damp weather. It is probably not very allergenic and skin tests never work. Alternaria is the harvest mould and is shed in enormous numbers near combine harvesting.